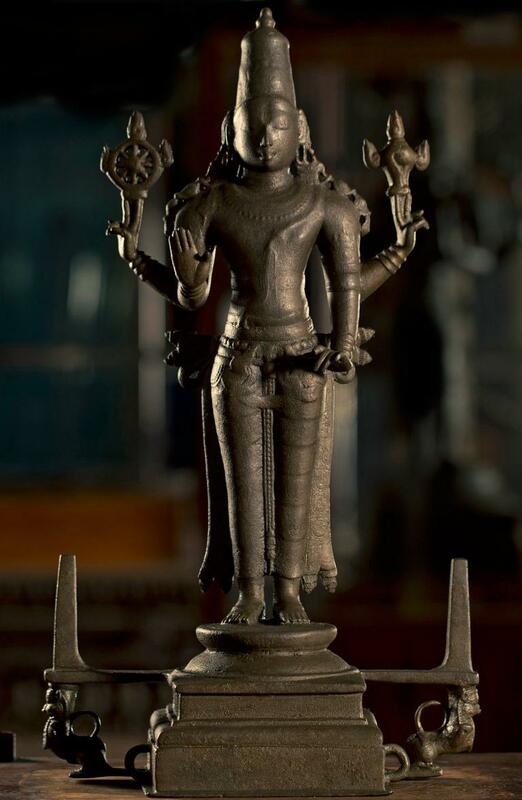 Vishnu is generally presented with four hands holding lotus, Sudarshana Chakra (discus), conch, and Kaumodaki gada (mace). Garuda is the mount of Vishnu and Goddess Lakshmi is his companion This fabulous structure of Lord Vishnu is standing in samabhanga pose and is four handed. Kiritamakuta is plain and conical. The image carries a chakra (disc) and shank (conch) in the two backhands. The lower right hand is in abhaya pose while the left hand hangs by the side so as to rest upon the hip. Srivatsa is not clear.